Matthew wanders through downtown streets making a series of calls to city and federal officials. He quickly finds that they seem anxious to keep a lid on his reports of slimy half-formed beings. 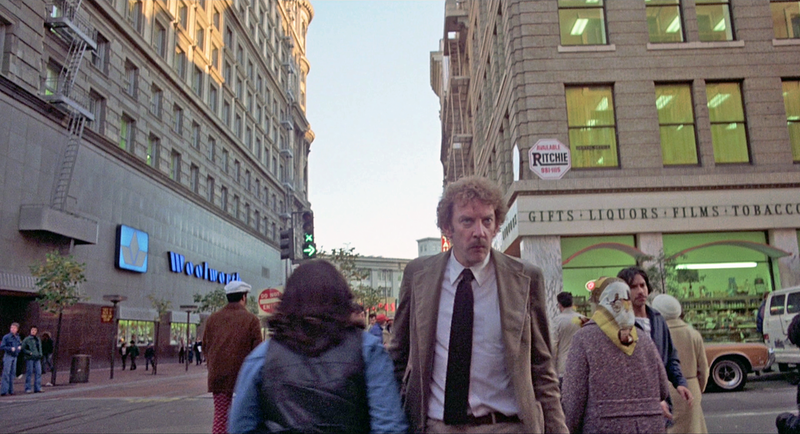 Then … He first meets a staff member from the Mayor’s office in Union Square. He is urged to not say a word to anyone. and Now, this is the northeast corner of the square at Post and Stockton (map). The steps have been expanded and one of the city’s Hearts, part of a citywide arts project, is on display there. In both images the St. Francis Hotel on Powell Street can be seen across the square. Then … Next he tries calling the Police Department but is immediately cut off. The high-rise offices in the background are Two Embarcadero Center on the right and the Alcoa Building on the left. 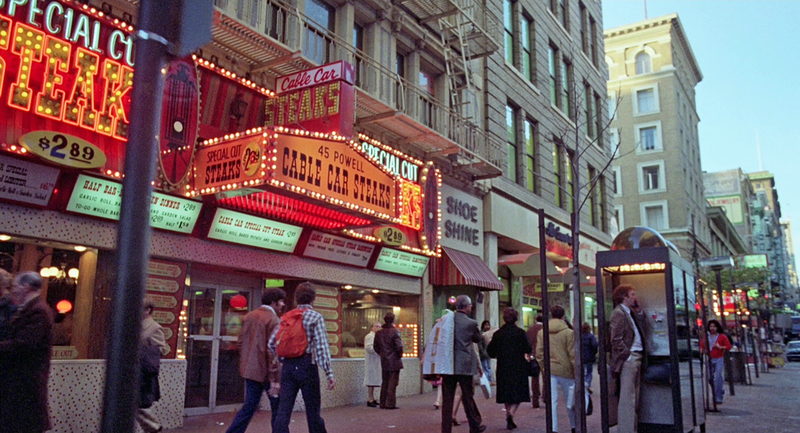 Harrington’s Irish pub is on the same block as the phone booth. 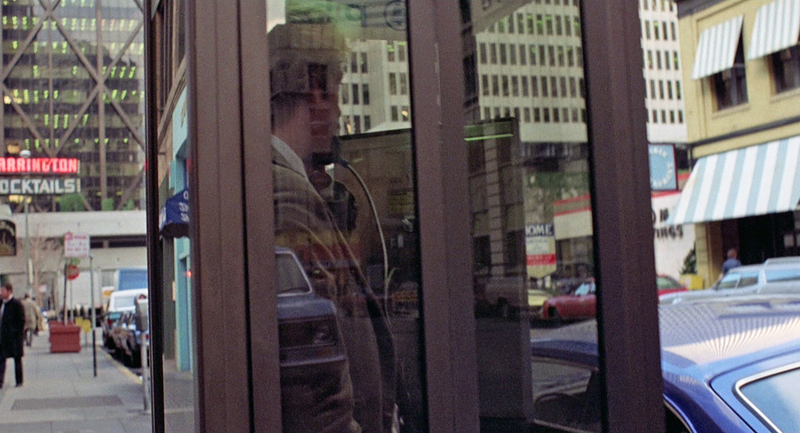 In these street scenes the camera swirls in constant motion, reflecting his confusion. 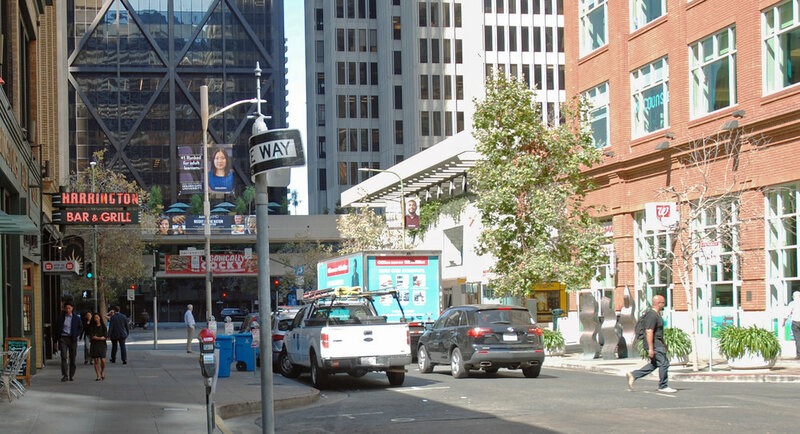 and Now, this is Front Street looking north towards and across Sacramento Street in the Financial District (map). The Alcoa Building is known today as One Maritime Plaza. Harrington’s, there since 1935, continues to slake the neighborhood’s thirst. Then … The Mayor’s office calls back and asks him to use his discretion, because “… this whole thing might be abating”. and Now, this is the junction of Powell, Eddy and Market at the cable car turntable (map). The corner building straight ahead at One Powell was built in 1921 , originally housing A.P. Giannini’s Bank of Italy, later known as Bank of America. 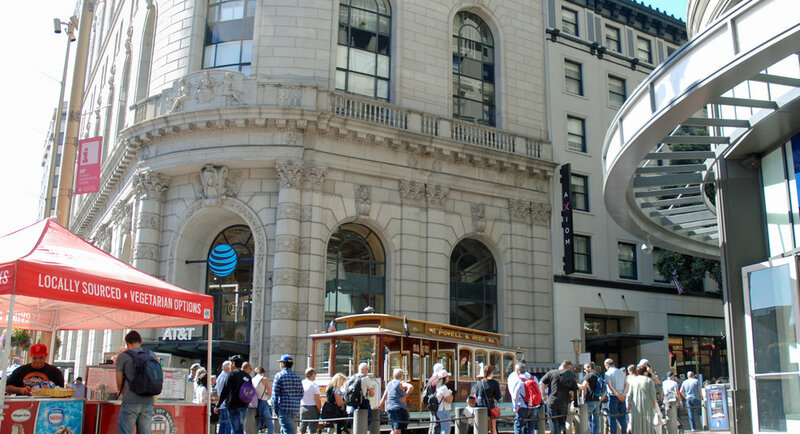 Today it’s a flagship AT&T store with redeveloped luxury condominiums above. Then … The Federal Preparedness Agency are equally unhelpful, telling him to keep an open mind. “Don’t mention to anyone about duplicate bodies, for God’s sake”. 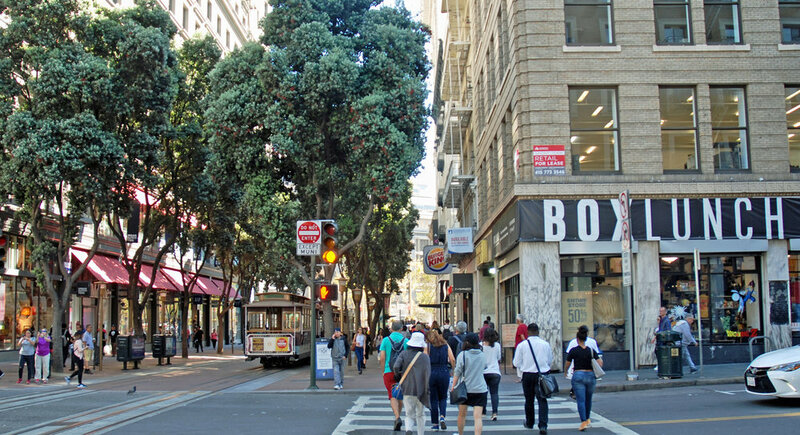 and Now, this is a half block up Powell Street from Market. 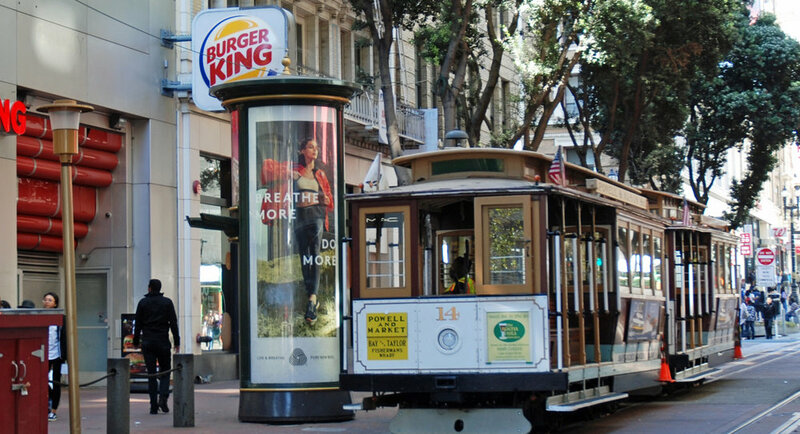 Burger King and the Mac Pro Store (partially blocked by the advertising kiosk and the cable car awaiting its turn to head down to the turntable) have replaced the Cable Car Steak Restaurant at 45 Powell. Then … His head is spinning as he walks the streets replaying in his mind the unified opposition from those very agencies and officials who should have been jolted into an immediate investigative response. Perhaps Elizabeth is right, this smells of a conspiracy. On the left a Woolworth’s store occupied the ground floor and basement of the Flood Building. and Now, viewed from Ellis, with Market Street crossing in the distance, this looks along the same block of Powell Street as the previous two Then images above, but in the opposite direction. Woolworth’s moved out in 1997; its site now houses The Gap.